Before we jump on to SharePoint Intranet Portal, let us first understand what Intranet Portal is and why do organizations need it. Intranet Portal is a private network to share latest feeds within the members of an organization. The Portal stores generic data, employee’s key information which is essential for every organization. Connectivity is strengthened and every member is aware of the current activities prevailing in an organization. Every company demands distinct Portal depending on the requirement. 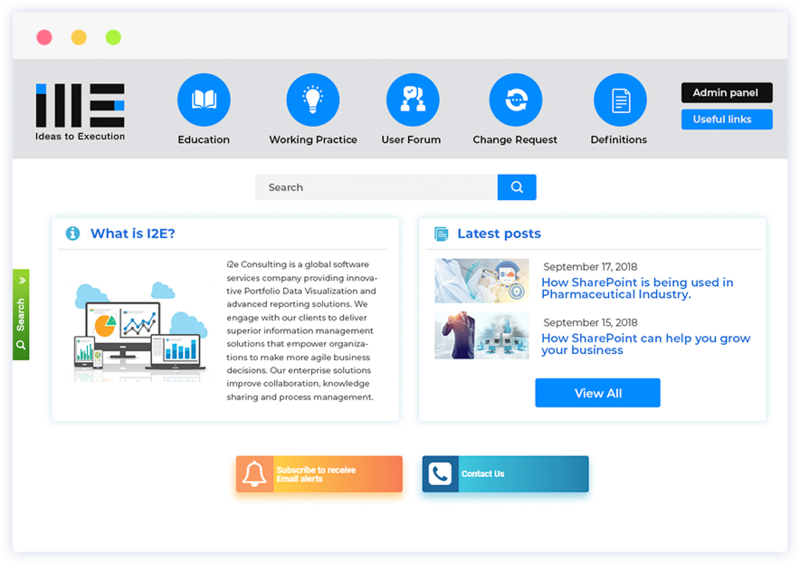 i2e Consulting, proudly connected as Microsoft Gold Partner, develops unique, collaborative, and innovative SharePoint Intranet Portal for organizations of every size. Depending on the requirement, our experts enhance the user experience in creating the best quality and flexible Intranet Portal. We acknowledge every minute details to implement and deliver Portal successfully on any platform- cloud, on-premise or hybrid. Along with these features, we have a dedicated team to take care of highly critical data which will be highly secured. In true sense, SharePoint Intranet Portal with all its advanced and optimized functionalities are customized to suit the structure of every organization. complex processes to engage users for collaborating in a mobile enterprise environment. Features to Maximize Employee’s interaction: Employee interaction is the trend which every Business follows. Along with reporting, HR tracking and learning management systems to streamline the user experience, we also seize the opportunity to introduce Opinion polls, feedback system, Employee recognition feeds to increase employee interaction. The users can comment, like, or share any feed to shower the support. We also provide a facility to integrate social media to connect employees in order to encourage collaboration and increase productivity. One-To-All Announcements: CEO of the organization addresses to all the employees which details about the performance of the organization. The SharePoint Intranet Portal empowers the organization to share the announcement to every member of the organization. Any constructive feedback or strategy can be directly inculcated to the CEO through the SharePoint Intranet Portal. take Business decisions in more appropriate way. Let i2e Consulting support your organization by building an environment where your employees have the authority to do what is best for the organization.